Samsung, the South Korean tech giant is venturing into a whole new tech game, Printers powered by Android operating system. Samsung announced the launch of the 10 new Android powered printers at IFA 2014. 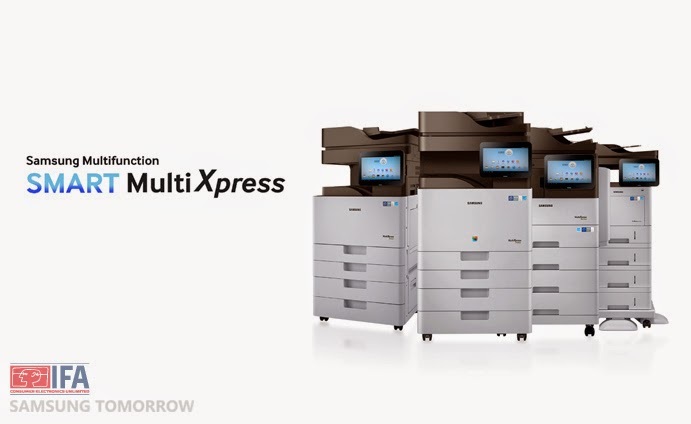 The printers which are essentially launched for business are sure to evoke some interest in the tech fraternity. For one, the printer can be used without without a PC. The all new ten Smart MultiXpress models come with a 10.1-inch touchscreen panel to search and print from web browsers, emails, maps, images and so on. The printers are available in four categories: The X4300 series of A4 Colour MFPs, K4350 series of A3 Monochrome MFPs, M5370 series of A4 Monochrome MFPs and the M4580 series of A4 Monochrome MFPs. These printers are also NFC-enabled and offer compatibility with Samsung’s XOA printing platform and Samsung Cloud Print. This means, users can print documents remotely via phones and other mobile devices. The company hasn’t disclosed the pricing and availability.